Pre-Requisites: Access Developer Level 10 strongly recommended, as you should watch all of my classes in order. However, if you're skipping around, you should have at least completed the Beginner series and the first 3 or 4 levels of the Expert series where I start to cover functions. You should definitely take Developer 9 and 10 if you are planning to build the Test Taker DB. Cost: $36.99 - Members get 50% off. Join now. This class continues our look at programming in Visual Basic for Applications in Microsoft Access (VBA, or Access VB). We're continuing on with the Test Taker database that we started in Developer 9. We're going to hide the "begin test" button when the test starts, we're going to show "question 1 of X", we're going to learn how to determine if another form is open, and if so, make changes to it, close it if a parent form closes (for example, if we close the Test form, the Question form will close). Lots of new tips and tricks in this lesson. Next we're going to add some timers to the test form. We're going to track the start and end time for the whole test, and for each question. This way you can see how long it took the student to complete the test, and which questions took the longest/shortest amount of time to answer. And we'll set a maximum time that they have to complete the whole test. If they're not done in time, the form will close. In Lesson 3 we're starting a new project. We're going to make a Universal Dialog Box. This is a box that is basically like a Message Box (msgbox) on steroids. You'll be able to change colors, fonts, buttons, etc. eventually. We're going to begin building it in this lesson. This is the 11th class in the Access Developer series. If you're serious about building quality databases with Access, and you want to learn how to automate your database with VBA Programming then don't miss out on this course. Of course, if you have any questions about whether or not this class is for you, please contact me. 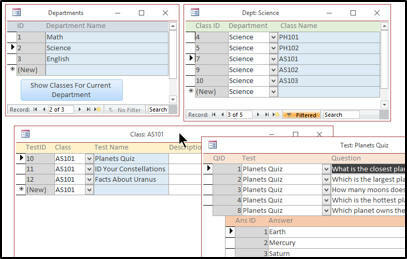 Richard on 8/25/2018: Access Developer 11 continues our in-depth study of Visual Basic for Applications programming with Microsoft Access (Access VBA). 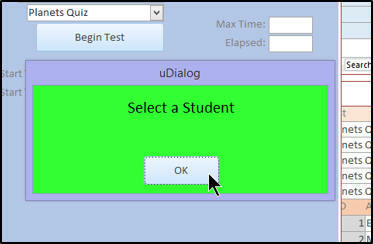 This course will continue our coverage of the Test Taker database and we will being building the Universal Dialog Box. If you're serious about building quality databases with Access, and you want to learn how to automate your database with VBA, then don't miss out on this course. Contents include: - Test Taker Database, Part 3 - Display Question 1 of X - Close Child Forms if Parent Closed - Tracking Start and End Times - Display Timer on Form, Timeout - RGB Function and Colors - Calculate Elapsed Time - Universal Dialog Box, Part 1 - Customized uDialog Box with Options - Lots more Click here for more information on Access Developer 11, including a course outline, sample videos, and more. This course was recorded using Access 2016, but most of the topics covered are valid for all versions of Access from 2003 on. This class follows Developer Level 10. The next class in the series is Developer Level 12.